Each user has a custom dashboard to navigate from. You can easily manage everything you need from one screen with a simple click. 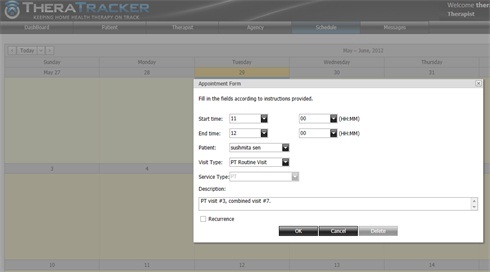 TheraTracker gives you multiple choices for search criteria to manage your payroll data and insure accuracy. Exporting your data to other programs is simple and easy. 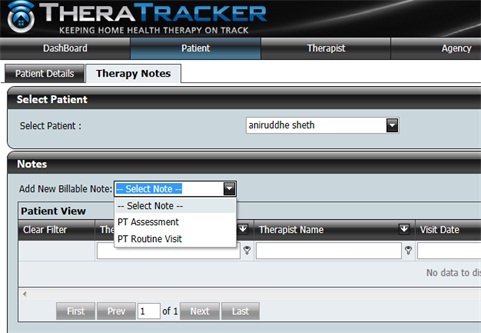 Therapists can schedule their patients through TheraTracker. Each upcoming visit is viewable by all of the healthcare team to help prevent missed visits and help coordinate reassessments. Each therapist can only pick specific clinical notes to create. Each note has built in mandatory areas like pain and vitals and also has auto prefill tools to help exceed documentation guidelines. Therapists are unable to submit notes that are out of orders or that exceed the cert period. 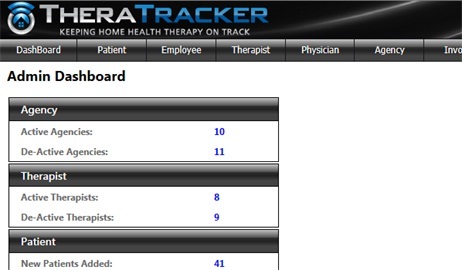 TheraTracker allows you control what access each employee, agency, or therapist should have. This allows you to set up employees with limited access to control security, or allow trusted individuals to add and delete information. Users can create messages to send to other users or groups. Simple messages can also be posted on the patient file for anyone on the healthcare team to follow. There will never again be an excuse for lack of communication! For TheraTracker pricing options, please click on the PRICING page. Month to month subscriptions are available or lower your cost even more with discounts for 12 month subscriptions or with a subscription to TheraFinder. If you have further questions, please CONTACT US and we will be happy to assist you! Copyright © 2019 TurnKeyTherapy, LLC. All rights reserved.